Pancontinental Resources Corporation (“Pancon”) (TSXV:PUC)(“Pancon” or the “Company”) is pleased to announce the acquisition of the St. Laurent Project (the “Project”), containing an advanced exploration target hosting a prominent 600-metre long electromagnetic (EM) anomaly with associated Ni-Cu-Co-Au-Pt-Pd mineralization. Pancontinental Resources Corporation (“Pancon”) (TSXV:PUC)(“Pancon” or the “Company”) is pleased to announce the acquisition of the St. Laurent Project (the “Project”), containing an advanced exploration target hosting a prominent 600-metre long electromagnetic (EM) anomaly with associated Ni-Cu-Co-Au-Pt-Pd mineralization. 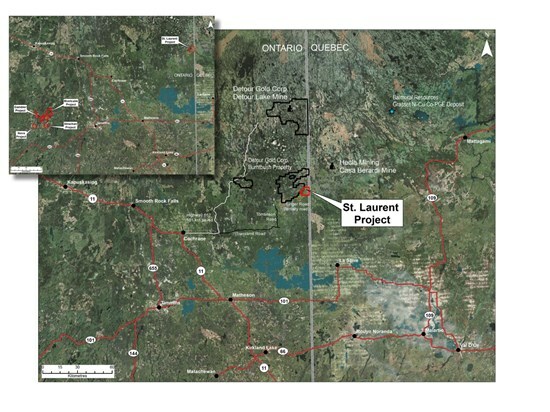 The Project covers 4,170 hectares and is located in St. Laurent Township, Northern Ontario, 160 kilometres northeast of Timmins, 50 kilometres south of Detour Lake Mine and 20 kilometres southeast of Casa Berardi Mine. From 2004-2007, Eastmain Resources and Xstrata completed a series of airborne geophysical MegaTEM surveys. Using 200-metre line spacing, the surveys revealed a prominent 600-metre long EM anomaly, coincident with the 1966 diamond drilling. The EM anomaly is strong and plunging to the northeast, below detection limits of the survey, and terminates abruptly to the southwest. St. Laurent’s gabbro-hosted geological setting and exploration characteristics provide an analogue to the former gabbro-hosted Montcalm Ni-Cu-Co Mine adjacent to Pancon’s other Northern Ontario projects. For comparison, the EM anomaly associated with the former Montcalm Mine was approximately 200-metres long, and the actual Montcalm deposit was approximately 350-metres long. On March 25, 2019, Pancon entered into an Option Agreement (the “Agreement”) with 2681891 Ontario Inc. to earn a 100% interest in the St. Laurent Project, which consists of 191 single cell claims and 18 boundary cell claims within St. Laurent Township in the Larder Lake Mining Division (see map below).